Quit F1 for good after being T-boned in a practice collision at Mosport driving for Wolf. 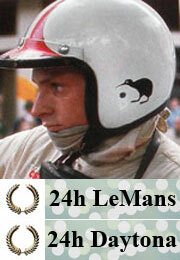 Widely regarded to be one of the best F1 drivers never to win a championship Grand Prix. Mario Andretti once joked that "if he became an undertaker, people would stop dying". Chris was involved in the design of the upgraded Taupo Motorsport Park circuit, used for the New Zealand round of the 2006-07 A1GP season in January 2007.